grisea, on rice plant leaves. In some parts of Asia, farmers are planting and growing record amounts of rice. For the two-thirds of the world's people who rely on the staple grain, this sounds like positive news. But intensive cultivation of rice has also given rise to something else—new, more virulent strains of the rice blast fungus, Magnaporthe grisea. Blast, which weakens and kills rice plants, can reduce yields by up to 75 percent in infested fields. Caught in a relentless tug-of-war, scientists, like those with the Agricultural Research Service, are continuously hunting for rice cultivars that resist the nimble fungus. But even after just one growing season, the blast pathogen can often find a way to bypass once-resistant rice plants—usually showing up as spindle-shaped lesions on plant leaves. According to ARS chemist Sally A. Leong, the pathogen has become a chronic problem in parts of Asia and Latin America. "In Asia, farmers are planting rice in almost any available spot, so they're seeing a rapid evolution of the Magnaporthe fungus," she says. Blast has also been inflicting damage on plants in the United States, alarming growers in California and several southern states and threatening to increase the price of U.S. rice. to abort rice blast infections. 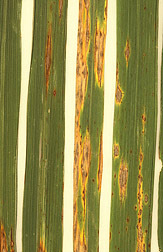 Leong and colleagues in the ARS Cereal Crops Research Unit, Madison, Wisconsin, have been working to unlock rice's natural defenses against the ever-changing fungus. Making significant strides, they've identified new resistance genes in rice that are uniquely linked to a gene in the fungal pathogen. 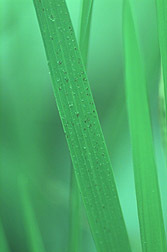 They are also developing a novel way to use these key genes that ensures rice plants even greater built-in protection. Having evolved side-by-side in many parts of the world, M. grisea and its rice plant host share a very specific relationship. In an interplay known as gene-for-gene resistance, the rice plant will launch a vigorous defense if it recognizes a particular gene product—a molecule or protein—in the invading fungus. The fungal gene is referred to as an avirulence, or Avr, gene. The plant gene that starts the defense response is called a resistance, or R, gene. "There are thousands of genes in rice that mediate various aspects of plant protection," says Leong. "But only a specific R gene—one that matches the fungus's Avr gene—is capable of setting off a strong resistance response in rice." During this defense response, plant cells near the fungal-infected leaf tissue are programmed to die. In this pronounced bid for survival, the plant cuts off life support to the fungus, preventing further advance. But this cell death is actually a secondary level of resistance. Other cell studies suggest that the plant is likely responding to an even earlier signal produced in its interaction with the blast fungus. What is this first line of defense? Are there others in the plant's arsenal? To begin to answer these questions, Leong and postdoctoral collaborator Mark L. Farman, now a plant pathologist with the University of Kentucky in Lexington, cloned and sequenced an Avr gene in M. grisea that is recognized by the resistant rice plant. This gene, called AVR1-C039, is the second Avr gene from the rice blast fungus to be cloned by scientists. Leong and other colleagues identified, mapped, and cloned the R gene in rice that corresponds to the fungus's AVR1-C039 gene. To understand all the cues and signals that are being exchanged between plant and fungus, the researchers are watching how the newly defined genes interact on a molecular level as well as cellular one. "From the moment the fungal spore lands on the rice leaf," Leong says, "we want to know where, when, and how it communicates with its host." A new rice plant is also arising from this gene work. The resistance genes that Leong and her colleagues are studying can be inserted into nonresistant rice plants to trigger their defenses. But to provide even broader resistance, the scientists have gone a step further. They're developing a system that applies the operative genes from both the rice and its pathogen. This new strategy appears different from past efforts, which have dodged the blast pathogen by breeding new resistant rice plants through classical methods. "We're not worrying about what the pathogen is doing or trying to anticipate how it will change next," says Leong. "Instead, we're focusing on the plant, hoping to provide rice plants with the most generic resistance possible." With this in mind, the scientists have designed a system that enables the expression of both the rice gene and pathogen gene in the host plant—resulting in a situation known as "complete signaling." Still fine-tuning their methods, Leong and researchers are working to better understand when and where the Avr gene's molecules or proteins are first perceived by the plant cell. In another approach, the researchers are working to instigate the resistance response by pretreating the transformed rice plant—one already possessing the desired resistance gene—with the molecules or proteins produced by the pathogenic Avr gene. "We introduce these gene products through a benign bacterium or fungus," says Leong. "Even better is using nitrogen-fixing bacteria as the vehicle, an approach that results in dual benefits for the rice plant." Rice isn't the only beneficiary of this work. That's because the Magnaporthe fungus is known to attack other cereals and grasses, including wheat, barley, maize, and even turfgrass. "We hope to be able to use our gene pair in these grasses, to achieve the same kind of signaling," says Leong. Leong and colleagues are also extending their research findings to help save finger millet, an important source of nutrition for resource-poor farmers in developing countries. It, too, is under attack by certain strains of the blast fungus. The researchers are sharing their gene discoveries with collaborators from the University of Bangalore, India. The ARS rice blast research will have broad applications. "This is one of the few systems in which both plant host and pathogen genes are cloned," says Leong, "so it serves as an excellent model for understanding the genetic and molecular bases of plant-fungus interactions. "—By Erin K. Peabody, Agricultural Research Service Information Staff. Sally A. Leong is in the USDA-ARS Cereal Crops Research Unit, 1630 Linden Dr., Madison, WI 53706; phone (608) 262-5309, fax (608) 263-2626. "Bolstering Rice Against Blast" was published in the August 2004 issue of Agricultural Research magazine.